This'll be a little less informative than other requests, but I figured now is a good time as any to do one after finding out that the author is the same as "My Big Sister Lives In a Fantasy World". This is about a mimic who is a woman. If you don't know what a mimic is, in JRPG (and Dark Souls) mimics typically take the form of treasure chests you can find in a dungeon. They're usually harmless if you don't go near them, but if you do try to open them, they will bare their razor sharp teeth and bite at you (some games, I think it's instant death or nearly instant death for the amount of HP they take). In Dark Souls, they even sprout legs and go after you iirc. 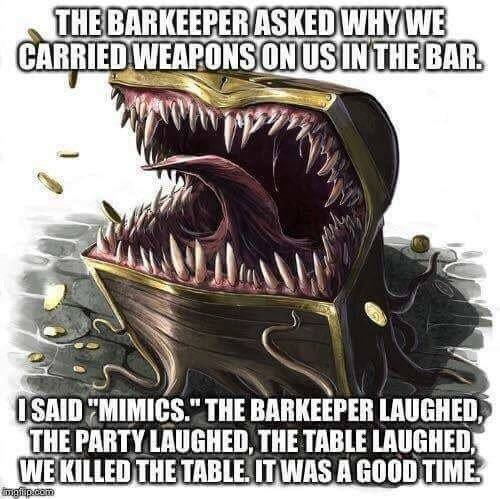 Mimics don't typically have a lot of HP themselves, so usually whacking the treasure box before opening is a good idea (except in games where doing so injures said treasure inside normal chests). I've only read the first one or two parts of the Syosetu / Narou version. One of the inserts features a few different monster girls in a shot with our treasure box. It sure looks like it's going to be a fun comedy series about enemies surviving in a dungeon. One piece of info from the opening said that monsters can't leave the dungeon or they die, so they'll be stuck down there. I wonder how they'll play with that and keep the setting fresh? It looks fun. The art is obviously good, and the open was definitely funny. If the rest of the book plays on expectations of monster vs Hunter interaction with some funny surprises, it could be really good. Being by the Big Sis author gives me hope too since that was a really fun series that had a lot of different elements going for it. Figure we may see some similar genre mixing here (Horror and Comedy are the obvious), and definitely some good comedy. Earth Star Novel. Same label as "I Said to Make My Ability Average". Just the one so far, released on the 16th of last month. This is new, so we may want to keep tracks on it to see if it does well enough to get more volumes. The Narou / Syosetu newest part was released on the 15th of last month (April 2018). Seriously, Japan never ceases to surprise me... oh, it's by the same author as NeeChuu, that makes sense xD. Do want this! Here's my vote. I'll add an LNDB page for the series later after I rest. Is this part just a subtitle for the first volume (Like what the author did for NeeChu), or is it something that will continue for each volume? IDK. It Google translates to "Reincarnation Monsters Different World Evolutionary Legend". The web novel Narou page also lists that in the heading, so I don't think it's just a one volume subtitle. Alright, guess I'll use that for the full Japanese title. For the romaji title, how does this come across? The WN started 19 months ago, with volume 1 of the LN on Amazon (seems self-published). It should be "Bikyaku Mimic Harumi-san." And for the record, the subtitle in English would be something like "The Rising Otherworld Legend of the Reincarnated Monster." Alright, added it to LNDB. Edit - In before I fucked something up and it's now permanent because of admin MIA status. @aruseus493 Looks good. That subtitle is just super awkward in general, it's 5 nouns in a row, I'm not 100% sure which ones pair off lol. It could very well be "The Legend of the Reincarnated Monster Rising in the Other World." Honestly why I submit only romaji titles typically. Let the English publisher decide on an official English title. Otherwise you end up with like 5 different English titles and no one will ever know which one to use when looking up the series. I’m still two volumes behind on Neechan, but this looks entertainingly fucked up like that series so I’m in. "My Lovely Legs Are Long As I Expected"
"My Mimic's Legs Can't be This Cute"
Just giving this one a little bump cause I am fairly interested. I did see a Novel Zero work that released in September of '17 got a sequel this month, so anything is possible.